The job: An annual, well-loved event. 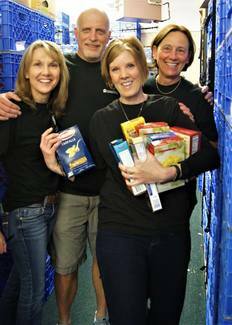 We help by staffing volunteers at the Issaquah Food Bank to sort and stack the goods received. This behind-the-scenes job will ensure that guests of IFCB have a smooth shopping experience. Age Restrictions: 16 and over only. Once you register to volunteer on the Issaquah Food Bank site you will receive and invitation to attend an orientation training prior to volunteering. This email is automatically sent out and can be disregarded, you do not need to attend the training.